How do I lock an Osper card to block all usage? If you’ve lost your card, left it behind at a friends house or if you don't recognise a transaction then you can lock the card instantly which will prevent it from being used at cash machines, in shops and online. 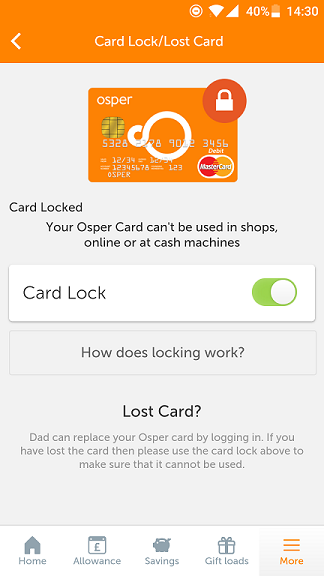 Please note: An Osper card can be locked and unlocked by both the parent and the young person. If you have lost your Osper Card, parent account holders can replace the card in the by pressing the Cancel and Replace Card button in red. If you have lost the Osper Card parent account holders will need to log in to the app and order a replacement (please see above).